For days surrounding our visit to Denali National Park and Preserve we had heard the term: ‘the 30% club’. This phrase was often used in the context of: "Are you a member of the 30% club?” or something similar. We learned as we toured the Park, that this term referred to those that have actually seen the top of Denali (or Mount McKinley). We found out on our bus tour to the Eielson Center that from its vantage point in June there were on average 3-4 days when, sometime during the day, visitors would see the mountain top and that during July it falls to 2-3 days and increases by a day or two as you enter August and September. Overall, given the number of visitors to the area around the mountain and the various methods used to see the mountain (entering the park, climbing the mountain, driving on the highway, taking a flight to view the mountain from the air and so on) that overall the ratio is about 30% of those that come to see Denali, actually do. Businesses offer discounts to those that say that they are members of the club and it is common to hear the question "Are you members of the 30% club?” while in the area. We’re not big on "clubs” however we did hope that we would actually see the top of Denali while in the area. We learned that our travelling companions who have travelled to Alaska numerous times over the last 25 years have only rarely seen the mountain top, thus we knew our chances were low (30%). 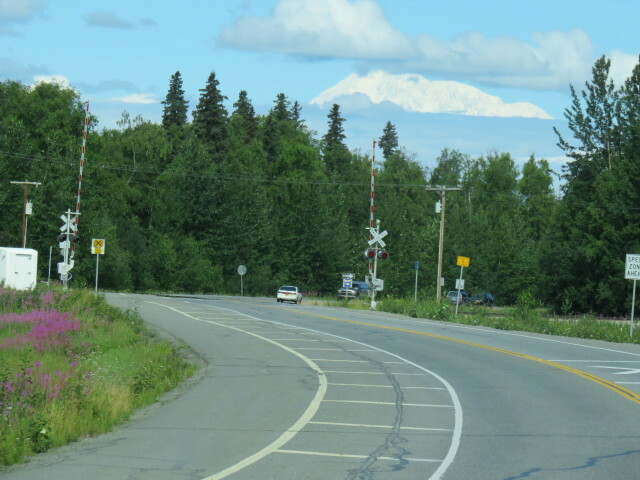 Thus after leaving the actual Park and driving to Talkeetna almost 160km (100 miles) south, we did not have any expectation of seeing the Mountain until I took a planned flight that would tour up around Denali (Mt. McKinley) as part of the planned itinerary. 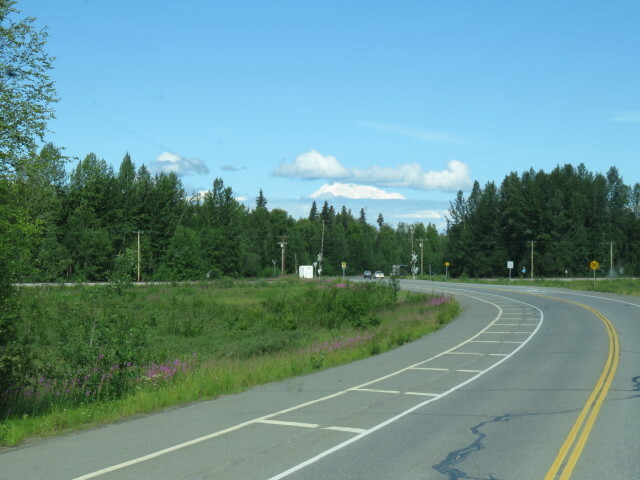 Imagine the surprise we experienced when, as we were approaching Talkeetna on a road off the main Parks Highway, we came over a hilltop on the highway and saw what looked like a very white cloud surrounded by blue sky and other clouds over a base of darker mountains. Jane and I instantly asked each other: "Is that Denali or is it a cloud?” As we were pondering that question our travelling companion’s voice came over the 2-way radio we used to communicate saying: "We think that white top is Denali, but we’re not sure.” Both Jane and Sandy began quickly looking at the maps to see, if in the direction we were heading, would it be possible that Denali would be ahead of us? As we continued to drive both Jane and I took pictures of this scene, which quickly disappeared as the highway descended and the trees obscured our view. Mine are attached. In the first photo you can see the snow-capped mountain under an overhanging cloud, supported by a range of lower darker mountains. Bear in mind that we were at that point 160 km (100 miles) away so it was a small image, and I was driving! With the second photo I was able to zoom in on it. The picture does not capture the stark white the way it appeared nor the sense of wonder we felt as we viewed this majestic mountain. We did however join the 30% club with an unforgettable sighting of North America’s highest mountain. Even more amazing was that we did not expect to see it and this was our first trip to Alaska. All in all, a memorable moment. Just a little further along the road we noticed a sign that indicated a photo location where you could stop and take a picture of Denali. As we approached we could see dozens of cars, trucks and RV’s stopped and people carrying various photographic devices rushing in the direction that would provide the view. This confirmed our suspicion that we had seen ‘’Denali’. For those that are interested (and more on our flight in another email) the Mountain was encased in clouds during my flight and I did not see it. 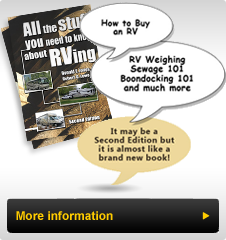 However seeing it through the expansive windshield of our RV more than compensated for it.